The American shipowner Edward Knight Collins operated transatlantic and coastwise packet ships and was the leading figure in America's most ambitious challenge to Great Britain's merchant marine supremacy in the 19th century. 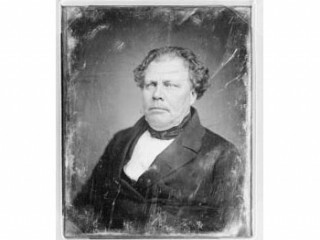 Edward Collins was born on Aug. 5, 1802, in Truro, Mass. He was a member of an old New England family which had emigrated to Massachusetts from England in the 1630s. His father, Israel Gross Collins, was a sailing ship captain, and Edward followed his father's example in choosing a maritime career. In 1817 Collins moved to New York City, where he was to live for the rest of his life. He worked in a mercantile house for a time and then made several voyages to the West Indies. He later went into business with his father, conducting a general shipping and commission firm. The association with his father brought some profits, which Collins used to begin his lifetime career as a shipowner. The first venture of Collins was the purchase of a line of packet ships that sailed between New York and Veracruz, Mexico. In 1831 he acquired a similar packet line in the coastwise trade with New Orleans, his ships carrying general merchandise to the South and returning laden with raw cotton. In 1837 he established a sailing line in the transatlantic commerce between New York and Liverpool. The Liverpool line was known as the "Dramatic Line" because the vessels were all named after leading stage actors. Collins soon became convinced that the future of commercial shipping lay with steam, not sail. Once England awarded Samuel Cunard a subsidy mail contract in 1838 to underwrite expected losses on Cunard's proposed steam line, the age of steamships had begun. Collins became an enthusiastic lobbyist for American subsidies similar to those enjoyed by Cunard. In 1847 Congress agreed to such a plan, authorizing the secretary of the Navy to contract with Collins and his associates for the creation of an Amerian version of the Cunard line. The venture was ill-starred from the first, poorly advised and poorly managed. Five steamships were to be built, all designed for possible conversion to warships. The Collins line (officially the New York and Liverpool Mail Steamship Company) was to run 20 round-trip passenger voyages annually for 10 years, for which the line was to receive $385,000 a year in Federal funds. But the ships cost almost twice the original estimates, and the company was in financial difficulties from the first. Although the ships drew many passengers and were very swift vessels (they were superior to their British competition), the firm lost money consistently even after the subsidy was paid. Poor management, higher than anticipated operating costs, and a series of maritime disasters spelled failure for the effort to outdo British merchant marine supremacy. In 1858 Collins dissolved his company. He died in New York City on Jan. 22, 1878. View the full website biography of Edward Collins.